Did you know that learning is happening all the time? 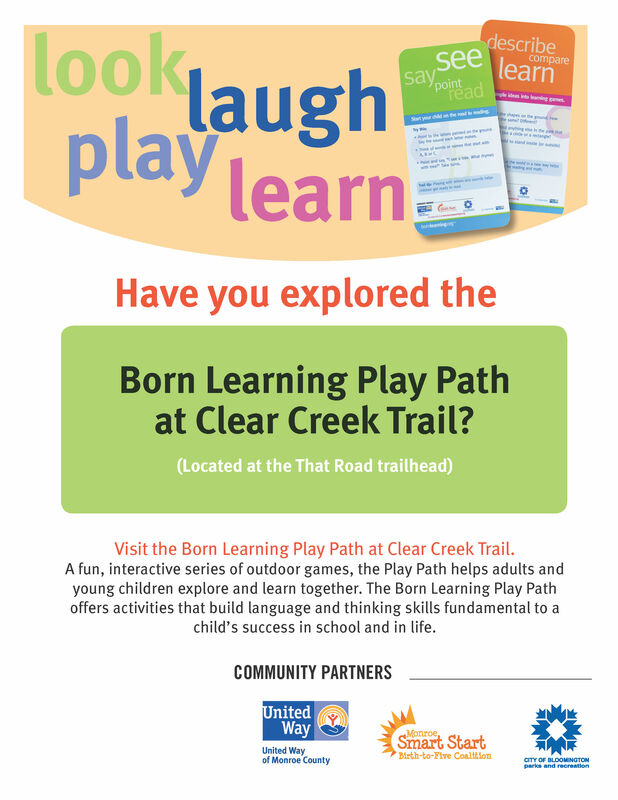 The Born Learning Play Path located on the Clear Creek Trail near the That Road trailhead features 10 fun, outdoor games on signs that will engage children and their caregivers. Born Learning provides research-based ways to turn everyday moments into learning opportunities for young children. Designed to support early learning, the Play Path helps adults and young children explore and learn together. The Born Learning Play Path offers activities that build language and thinking skills fundamental to a child’s success in school and in life. Part of United Way's Born Learning initiative, the Play Path helps adults understand what they can do to support learning in young children. Those first five years are when the most brain development occurs. It is also the time to establish foundations for the skills and attributes that are necessary to succeed in school and eventually to become productive, involved citizens. Gives family members, caregivers, friends, and neighbors an opportunity to “connect” with young children. Games like these will get children’s brains and bodies moving. Physical activity exercises a child’s body and mind. Encourages adults to see the world through the eyes of children and notice what they are curious about and are trying to learn. When you follow a child’s lead, curiosity and confidence grows. Helps adults interact with children to boost language and literacy development and helps caregivers understand how to best support early learning in everyday moments. Paying attention to children helps them to feel special and secure. United Way of Monroe County, City of Bloomington Parks and Recreation, and Monroe Smart Start partnered to bring Born Learning to the Clear Creek Trail. 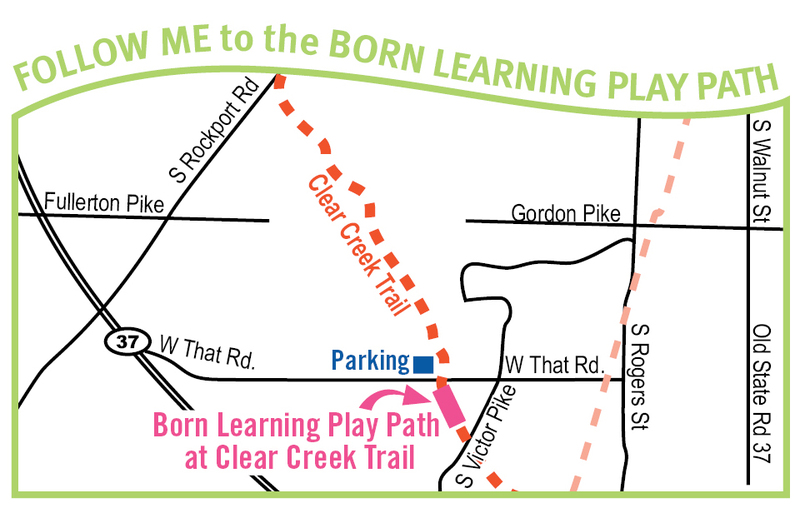 Use of the Clear Creek Trail and the Born Learning Play Path is free. The Clear Creek Trail is open daily from 5 a.m. until 11 p.m. and is wheelchair accessible. This paved trail and play path are also accessible to strollers and bicycles. The Play Path is approximately 300 feet long and begins just past the footbridge, immediately south of the That Road trailhead on the Clear Creek Trail. 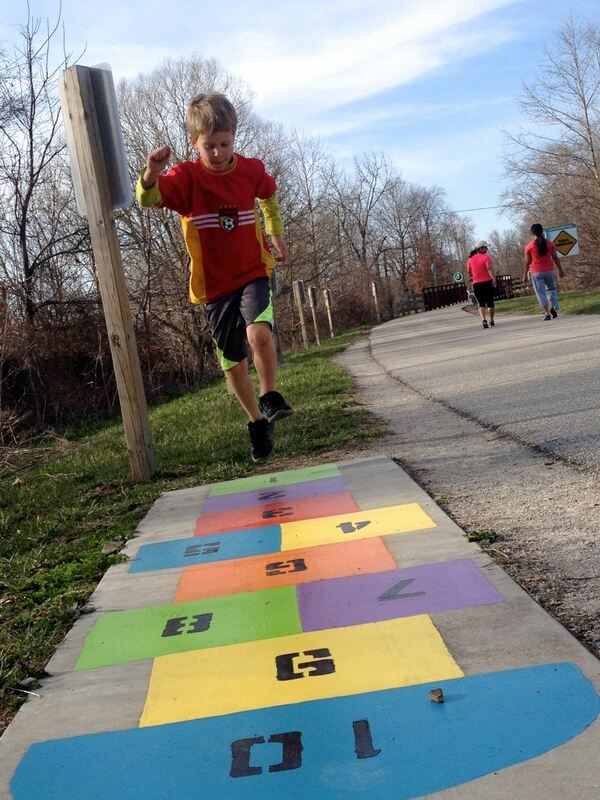 Bloomington Parks and Recreation also offers a Born Learning Play Path "passport" that, upon completion of the Play Path activities, can be redeemed for a free children's book.